In this short science career video we meet Emma. Emma is post-graduate student at the University of Nottingham, completing a PhD in the field of theoretical cosmology. As an undergraduate at the University of Sussex she made history when she became the first woman to win the top prize at the Science, Engineering and Technology Student of the Year award despite tests at school which showed that Emma was not only slightly dyslexic, but that she also had very poor arithmetic skills and she says “a nearly non-existent visual memory.” Her project used ideas from particle physics to explain recent observations that the universe appears to be expanding at an ever increasing rate. Emma became interested in space through reading science fiction as a child. She also became obsessed with mathematical problems. Emma went to an all girl’s school and was one of only two people who took physics. Tests at school showed that not only was she slightly dyslexic but that she had also very poor arithmetic skills and very little visual memory. Emma has very strong views on how physics is taught in schools and has become involved in a programme that places post-graduate students in the classroom. She aims to encourage children not to be scared of physics and maths. 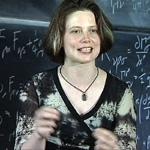 Most of her Emma’s work involves finding and manipulating equations to solve cosmological problems. Her undergraduate work took ideas from particle physics and applied them to cosmological theory. Her current work looks at creating mathematical models to explain an observational riddle. She has taken equations from the work of the famous Russian Zeldovich and applied them to her problems. Her initial results have started to be applied to data sets and are looking really promising. Emma finds that her best work comes to mind when she is distracted by her pass-times: live-role play, Kung Fu and Broadsword fighting, playing the harp, science fiction and drama! Radio 4 series including interview on Maths and Dyscalculia featuring Emma J King.